It’s impossible to overstate the brilliance and cultural impact of ‘The Simpsons’. It’s the reason why most of us think what we think is funny is funny, whether we’ll admit it or not. It’s just as impossible to agree on what constitutes the “golden age” of the show. Everyone agrees that there’s a certain time frame in which ‘The Simpsons’ was the best show on television (and possibly ever), but we all have a different interpretation of when that era started and stopped. Some people think it was the first 9 or 10 season. Some people narrow that down to 1-8. Some people with impossible f**king standards think it peaked from seasons 3-5, or even 4. For this week’s Sports On TV column, I used the most generally agreed-upon definition of the show’s prime: season 2 through season 8. Tackling the best sports moments of a monster like ‘The Simpsons’ is tough, so consider this a Part 1 of its own series, destined to include a Part 2, Part 3, and even a Part 4, should we delve into those wretched, later season guest star hives like “Homer and Ned’s Hail Mary Pass”. 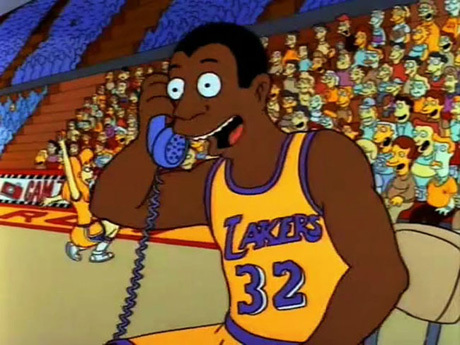 So please enjoy the 20 best sports moments from the golden age of ‘The Simpsons,’ and be sure to drop us a comment and share your love. Special thanks to Ari Amaru for the screencaps.